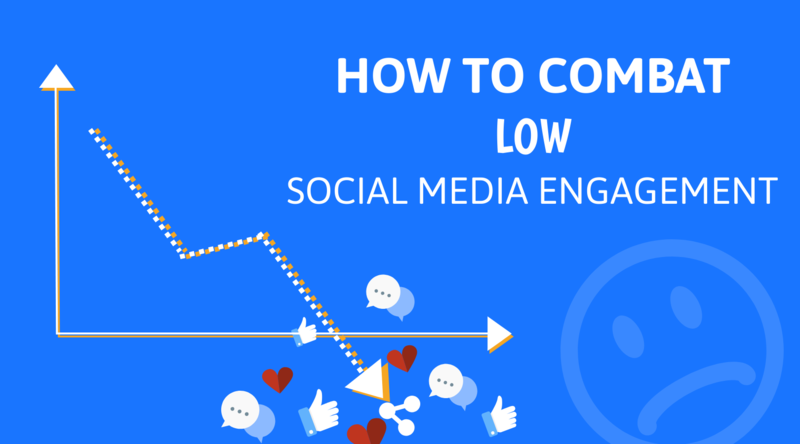 Have you got a problem with low engagement rates on your social media channels? Are your posts not being shared as much as you would like? Do your Tweets not get retweeted? Is your content not ‘liked’? Then we’re here to help. Many businesses come to us for social media services, and in their initial approach, they mention that the content which they are publishing on their social media channels isn’t generating any engagement. This isn’t always a major problem, as it depends on what the objective of posts are; If you’re posting as part of a brand awareness campaign, and your posts aren’t generating any engagement, then it’s cause for concern. It’s important that you are clear on the purpose of your social media activity – what is the ultimate goal? Is it to increase brand awareness and the size of your audience? Is it to drive leads or sales? There is very little point in ‘doing social media’ just because ‘everyone else is doing it’. If you’re not getting any sort of engagement, then go back to basics. Think about the platforms you are using, and whether they’re relevant to your audience. If you’re B2C and have got a ‘visual product’, such as clothes, holidays, flooring, soft furnishings or food and drink, then is LinkedIn the right place to be posting content? No. Instead, use Instagram, Snapchat and Twitter to promote your products and entice your audience into buying from you, by playing on how attractive the product is. If you’re B2B, and are looking to generate leads, then platforms such as Facebook and Instagram are going to do very little to help you with this, as the audience simply isn’t there. In this instance, LinkedIn is by far the superior platform, with its user-base comprising of professional individuals. If you want to know more about finding out which platform your audience uses, then we’ve written another helpful blog post about that exact topic. Another aspect to think about is the timing of your posts. This is something we’ve mentioned in a number of other blog posts, but that’s because it’s one of the fundamental rules of getting good engagement from your posts. It’s vital to think about when your audience are most likely to see your posts. If you’re a B2C brand, then the chances are that your audience are at work during the day, and so less likely to see your posts. However, you can work around this by thinking about when they’re likely to be online. For example, they may browse Facebook during their lunch hour or scroll through Twitter when they’re stuck on that inevitably delayed train home. In the evenings, the chances are they’re browsing their social media channels while also watching TV, although be mindful not to post during the more popular soaps such as Eastenders and Coronation Street, as the audience will be paying more attention to the programme than social media. In the modern era of social media, if you want to generate engagement, you should be posting more than just text. This is where images and video content come in. On Twitter alone, posts with images are 34% more likely to get retweeted than those without, according to research. On Facebook, images receive an average 87% interaction rate, which is considerably more than the next best type of post – those with links – which has a 10% interaction rate. So there is clear evidence that images perform the best, particularly those which are created specifically for the business, and aren’t stock photos. However, you have to ensure that the images you are posting are relevant and look professional. If you have a designer in house, then make use of that resource! In an ideal scenario, a non-designer or those with little to know knowledge of image creation and manipulation shouldn’t be creating images for you to be using on social media, as there is a strong chance that your imagery will look unprofessional and reflect poorly on your business. Polls are also a good way of generating engagement as it gets your audience talking. Nothing creates engagement like a difference of opinion, particularly when posting content which is controversial (but not extreme!). Bookmakers such as Coral and Bet365 are particularly good at this sort of thing, creating ‘Best Elevens’ for certain football teams, but including a player which isn’t as popular or arguably as good as another for that position. Another advantage to polls is that they are incredibly quick and simple to produce, and are a great way to find out how your audience feels about a particular topic, subject, product or service. If you want engagement, you’re going to have to do a bit of engaging yourself. If someone is talking about your business, engage with them! Like their post, reply to it, retweet positive feedback… It shows that you care about your audience and are interested in what they have to say. Also, consider engaging with other brands, whether you work with them, against them or for them! There are many examples out there, Poundland for one, of brands who like to engage with others and it always attracts high levels of engagement. Finally, we come to the great Organic vs Paid debate. Organic content, that which has been posted and not ‘boosted’ or ‘sponsored’, is often viewed as ineffective as social media platform algorithms tend to favour sponsored content. By restricting the number of people who can see organic posts, particularly if you are using a third-party scheduling tool such as Hootsuite, SproutSocial or AgoraPulse, they are effectively penalising businesses who aren’t currently investing in sponsored posts, which of course generate revenue for the platform. Organic posting still has a place in the social media marketing mix, but it definitely isn’t as strong as it once was. To summarise, if you’re looking to combat low engagement on your social media channels, then there are a number of tips in this article which should help you do just that, but if you would like some more information or advice, then get in touch with us and we’ll be happy to have a chat!